Then gradually introduce weaning food as described from the 4th – 6th month. The ideal HiPP products to start with are those with "from 4 months" on the packaging. Have you started with weaning food after the 4th – 6th month? Yes – your baby is eating a full proper meal from a spoon? Then you can integrate the second weaning meal into the menu plan – a filling milk-cereal pap in the evening. A cereal-fruit pap in the afternoon is recommended as the third weaning meal. Early morning and later in the morning: The baby still gets breast milk or HiPP 2 Follow-on Milk. At lunchtime: At lunchtime you can offer your baby a menu. HiPP has many different kinds on offer, so that your child can get to know the full range of flavours in our foods. There are menus with meat, fish and also vegetarian menus. Menus from the 6th month are slightly coarser than menus for after the 4th month, as a gentle cross-over to the products containing small chunks for from the 8th month. For dessert we recommend a few spoonfuls of fruit rich in vitamin C. The vitamin C helps the body’s absorption of valuable iron from the meat. In the afternoon: In the afternoon you can carry on breastfeeding or giving your child HiPP Milk Formula. 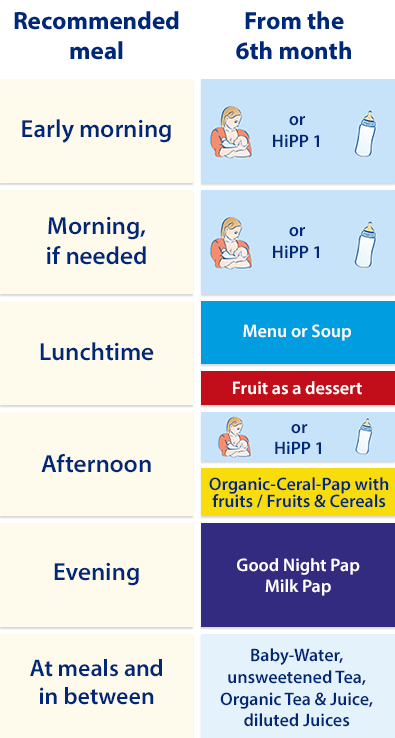 In addition to the milk meal, you can also offer your baby a few spoonfuls of HiPP Fruit & Cereal. In the evening: As the second complete weaning meal, a milk-cereal pap now replaces the evening milk. HiPP Good Night Paps – without added sugar – are ideal as a filling evening meal. Either ready prepared in a jar or in powder form to be mixed with water.